The Hotel Metropole was built in 1890. Faced with red terracotta, the hotel was markedly different to the surrounding seafront whitewashed properties. The building was designed by Alfred Waterhouse, the architect of University College in London and the Natural History Museum. The cost of construction was £57,000. In all, a customs house, 12 lodging houses, a parade ground and a park were cleared to make way for the hotel. When the hotel opened, a lot of the patrons were welcomed and serviced by staff from the recently opened Grand Hotel next door. The London Times reported on the opening of ‘the most prominent building on the Kings Road’, noting that 1500 people arrived on a special train from London: ‘The Metropole’s own band played in the ball room (Clarence) and the Coldstream guards played in the central dining room. The Italian garden was lit by numerous electric lights producing a sparkling and dainty effect’. All the furniture was designed by Maple’s. There were three dining-rooms capable of seating 500 people; these were decorated in colours ranging from golden brown to ivory white, with matching curtains in silk. The vaulted ceilings were cream and gold. The smoking room had easy chairs, covered in fine Persian saddle bags and throw rugs. Below this were the Turkish baths. The rooms were filled with scent created by the hotel’s own perfumier, and were decorated by Albert Kingsley and the brothers Temple. There were many English touches in the hotel, such as large fireplaces, including a carved oak one which was designed by Queen Victoria’s nephew. The bedrooms consisted of lavishly decorated suites, modest ‘bedding rooms’ and en suite bathrooms, where patrons could choose hot or cold fresh or sea water. The water came from the newly designed ‘tapped water wells’ (or taps). Prices ranged from 3/6d for single room to £3-8s for a suite ‘with servant meals at 6/ per day’. The hotel boasted its own printing room that made all the stationery and menu cards right up until 1982. Among the many facilities were the newly created Clarence Rooms, which had their own entrance in Canon Place. Designed as a wagoned ceiling ballroom, with an octagonal reception room and a ‘crush’ room for light refreshments, the first use of this room was an ‘at home party’ with Miss Campbell. A Cinderella dance was hosted by the Middlesex Yeomanry Cavalry shortly afterwards in the room, which was built on an old marching hall. Many characters have passed through the doors of the Metropole, including the ‘Gaiety girls’, Princess Louise (daughter of Queen Victoria), and Lillie Langtry. The hotel was also used for a few seedier trysts. A new law was passed that allowed a couple to divorce if the husband was ‘caught’ with a female (not his wife) in a bedroom. All that was needed to secure a divorce was a witness (such as the maid) or a hotel bill showing joint occupancy. On the 14th November 1896, the front of the hotel was the finishing post for the first London to Brighton car run. The cars left from the London Metropole, and the event is still held every year to celebrate the abolishment of the speed limit. Several hundred military men were stationed at the Brighton Metropole during both World Wars. Due to the large military camp at Shoreham (the first licenced aerodrome), the Metropole became an aircrew holding unit in 1941 for the RAF and other allied nationalities. (In fact, three major airlines still station their air crews overnight at the Metropole today). The building saw some action in the Second World War when a roof-mounted machine gunner spotted a low flying FW190. The surprised plane retaliated. Another German plane later tried to bomb the hotel, but missed and dropped its pay load in a nearby park. The hotel was part of the Gordon hotel chain from its construction up until 1959, when it was was acquired by AVP industries. The hotel then underwent a major revamp, which included the addition of bathrooms to all its rooms. People who remembered the original artwork were horrified to find that some of it had vanished or had been covered up. The change to the roofline meant that the central spire and small turrets were removed and two new floors added. The winter gardens vanished into the new Regency ballroom, and a large conference suite topped by a tower block was included in the scheme. This meant the demolition of another row of houses and the graceful St Margaret’s church. Strangely, some of the old building walls were used in the construction and support of the new buildings. The new Starlit restaurant (Chartwell room) on the seventh floor commanded a view across the whole of the sea front. The Clarence room was the venue of the opening of the first licenced casino in Britain. The casino’s walk-in safe can still be seen (it is now impossible to remove without demolishing part of the building). The casino moved to the International Casino in Preston Street in 1985, and the original Metropole logo can be seen on the windows. Modern times made their way into the life of the Metropole with the construction of a swimming pool and health club in the space occupied by the former Turkish baths. The Metropole group was acquired by Lonrho group for 25m in 1977. This led to further expansion, including the opening of the Cannon (steamers) bar and the Metro (steamers) night club. In recent years, the hotel has changed hands to the Stakis group and is now part of the Hilton group. I was employed in the Casino at the time it opened on the 2nd June 1962 as a Cashier, the safe was not a walk-in. Large, yes, but the cash desk and safe were housed in what must have been once some sort of alcove. Maybe now it has been bricked in. Exciting, glamorous times, I ended up reluctantly as the General Manager and took voluntary redundancy in 1985. The Casino was kept alive by the total dedication of Ken Harrison, who has recently died. I was there from the time it opened to the time it closed, if you want to know anything just ask. My great grandfather Charles Ferdinand Barral was working as a chef at the Metropole from 1892 until he went to work at the Adelphi in Liverpool in 1896. I am particularly interested to know if the Metropole has records and photographs dating back to that time. My great grandfather, Francois Bonnot (or possibly known as Francois Martin) worked as a chef in a seafront hotel near to the old Artillery Street – educated guess is that this was possibly The Metropole – does anyone know if any staff records exist? My great-grandfather was working as the head-waiter at the Metropole during the First World War, probably about 1915. We don’t know his name, just that he gave my grandmother Violet Agnes ‘Chapman’ up for adoption in August of that year to St. Wilfrid’s Home. If the employment records are available, we hope they list the position of the employee so we can pinpoint his name. Also, Violet’s uncle, William Albert Johnson, worked there as a kitchen porter until 1923 when he died of a heart attack. My paternal grandfather, Ernst Liechti, a Swiss immigrant, was a waiter at the Metropole for many years. I’m not sure, but he may even have been Head Waiter in his later years. I dimly recall, when I was about six or seven years old (mid-1950s), being taken by him to the staff Christmas party. For some reason I wasn’t actually allowed in, but had to wait at the kitchen back door where a steady stream of tiny sandwiches, petits fours and other delicacies was passed out to me. My grandfather had a long career as a hotel waiter; I have a photograph of him and the other staff in front of the Royal Albion Hotel, dated 1913. My great grandfather William Frederick Strong was supposed to have had a senior position in the building of the Metropole. His occupation was always stated as Master Builder and other prominent buildings in SW London were attributed to him. As the family emigrated to Australia in 1913, research has been difficult. I wonder if there are any publications about the building of this impressive hotel? Having spent 52 years in the hotel and catering industry (many years in Brighton) I am currently researching material for a book about the hotels of Brighton – Metropole, Bedford, Old Ship, Royal Albion, Grand, Dudley, Queens, Royal Cresent etc. Any memories or anecdotes of people having worked in any of them would be greatly appreciated. Hello Mr Tulley. As a fan of Mark Sheridan, the great music hall comedian and able singer of lusty seaside songs who appeared in pantomime across the British Isles,(as regards your book), I thought you may like to know that Mark often stayed at the Metropole Hotel in Brighton around 1909. Also the Bedford Hotel Brighton, which he mentions in one of his famous songs ‘By the Sea, by the Silvery Sea’, recorded 25th Oct 1910. Mark also recorded the song ‘I do like to be beside the Seaside’ in Oct 1909. I hope this may be of interest for your research. Regards, John. Hello again Mr Tulley, I forgot to mention, the song ‘I do like to be beside the Seaside’ was penned by Mark Sheridan in Blackpool 1907. Composed by John H Glover Kind and published by Feldmans, it was one of Mark’s greatest hits. He took the song to Glasgow, the Coliseum, where it was heard in public for the first time – and the rest as you know is history. ‘In his song by the Sea, the Silvery Sea’ he mentions a place he describes as the Bodega (was that a theatre? ), he mentions it was where the principal boys and actors hung out. I hope you find this interesting. John. My Great Grandfather Charles Tenucci was employed as the Chief Fire Officer at the Hotel and lived at 168 Lewes Road. I am not sure how long he worked there but by 1898 he had moved to Dartford Kent. I am trying to locate Mick Mercer who previously worked in the kitchens (chef) of the Metropole Hotel, Brighton c. 1965. If anyone knows of him please contact me at tjenner@talktalk.net Thank you. Hello John. Thanks for your comments which are very helpful. As regard to your reference about the ‘Bodega’ I can only think it refers to a drinking establishment of the same name which is now the Hotel du Vin in Ship Street. Hi Malcolm, There are other pictures of the Metropole Baths which I believe stem from leaflets published by the hotel during its heyday. I know of at least one from a series of drawings by W.H. Oakley, stating “There is a most complete and comfortable Turkish Bath, with salt water plunge, containing every modern improvement, on the ground floor of the western wing of the hotel. It is open from 10am till 9pm”. Have a look in Brighton Reference Library in their Preserved Pamphlets section. In 1970 a Health Hydro was opened in the hotel and in 1986, in recognition of the trend towards hotels with swimming pools, a new pool was opened in the basement. I have many great memories working at the Metropole Hotel as a page boy in 1959. I would love to meet some of my old pals that worked there from 1959-1962. A number of contributors have asked about the possible whereabouts of archive material relating to the Metropole. Does anyone know of papers anywhere? My grandparents and great aunts and uncles started their careers here in the 20s and I would love to find out more. The Metropole bought my uncle Jack’s terrace house in Cannon Place back in the ’70s (I think? ), for the extension into that road. Doubt he got much for it, as it was held together by cobwebs, dust and cat’s fleas! They subsequently moved to Malden Road on the proceeds, which was probably an improvement! Love the “held together” by cobwebs, dust and cat’s fleas, Stefan. That cracked me up. My parents spent their wedding night at the Brighton Metropole on 28/07/1962. Is this the same hotel? In an old catalogue (c. 1890) of my late husband’s family business, there is mention of a clock built for the Metropole Hotel. 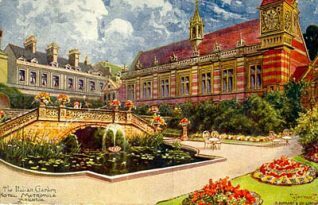 I am unable, from old postcards, to identify a clock on the frontage of the building but notice a turret in the Italian Garden with what appears to be a clock adorning it. Any information you can impart would greatly help in my research. I am surmising that the clock was destroyed in the major revamp in 1959. Thank you.